You're playing in a multiple deck game where doubling down on soft hands is allowed. 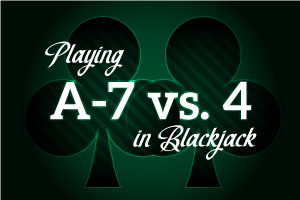 You're dealt an Ace and a seven, which gives you a total of 8 or 18. The dealer has a poor upcard of four. Is this is a good opportunity to double? Well, our reflexes tell us to absolutely get double the money down on the table and take home a winner. But before jumping to a conclusion - and because we're being clinical about this - let's break down what we're looking at. As is the case in many doubling situations, you will have a greater winning margin (in terms of the difference in hands) if you simply hit this hand. That's because you would be able to draw more than one card, giving you more opportunities to make a good, solid standing hand. But to make hitting the more favorable option here, you had better be able to win a LOT more hands. In the situation before us (A7 vs. 4), you'll win nearly 53% of your hands by hitting, losing 35% of the time. That's a big gain - 18 hands per every hundred. When you double it, though, the win-loss ratio of hands is about 52%-40%. That's a difference of 12 hands per hundred, but it looks different when you're doubling. Imagine, on the basis of $1 per hand, $52 won per hundred hands as opposed to $40. But $104 to $80 is a bigger differential, isn't it? You see, with the doubling factored in, that represents a difference of 24 units per hundred. That's what makes doubling the appropriate play here.